What is OpenSensors (aka SensorSDK) Server Side? OpenSensors is composed of many pieces, one of the main pieces is the server side. The server side allows you to keep track of your sensors, alert you when any of your sensors is not reporting data or the monitored value gets outside the normal bounds, and chart your monitored variables among other things. 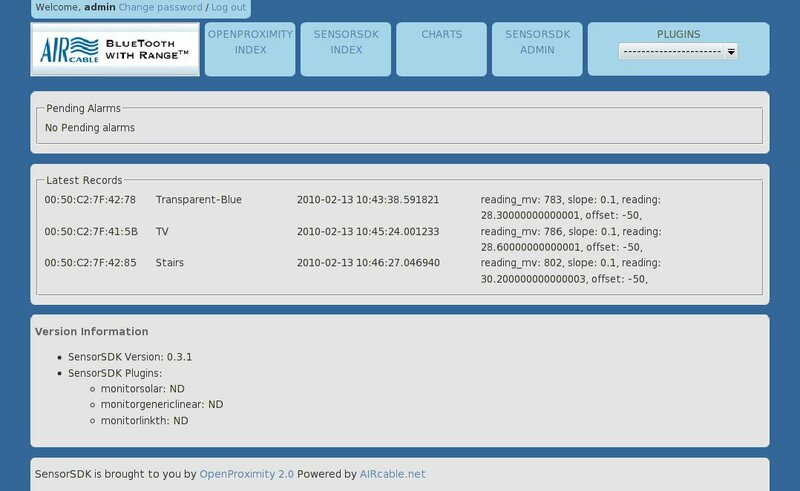 OpenSensors is nothing more than a plugin for OpenProximity, you can get in a same computer sensors and proximity marketing out of the box. OpenSensors is also a plugin provider, this means that each sensor that OpenSensors can talk to gets it's own plugin, which are quite easy to create, getting all the advantages of OpenSensors without spending resources in development time. How does OpenSensor Server Side look like? If any of your sensors had trigger an alarm and this alarm is still valid then you will get them listed here. For each of the sensors OpenSensors knows about you will see an entry on this list, this will show you when was the last time each sensor reported it's values back. On this list you can see the running version of OpenSensors and each of the OpenSensors plugins you have on this computer.